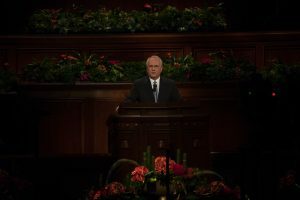 “My testimony is that the Savior is putting His name into your hearts,” President Erying said. 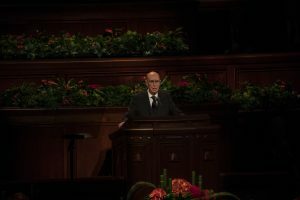 President Eyring said how he admires the love from the members to serve those that are hit in natural disasters. He encouraged members to pray with confidence to know what the Lord would have them do to be guided to to serve. He said that helping the children of God in their troubles will make your own lighter. Brian K. Ashton, Second Counselor in the Sunday School General Presidency, said learning more of the Father helps us to progress. He explored the characteristics of Christ, such as faith, hope and charity. 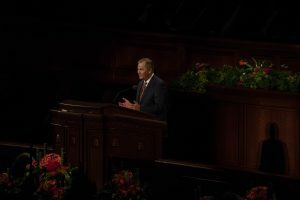 “I take great comfort in the fact that those who strive to be obedient will receive grace for grace” and ultimately “receive of his fulness,” he said. He said to press forward and testified that trying to become like the Lord is worth the sacrifice. 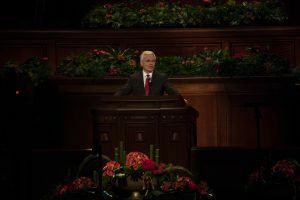 Elder Robert C. Gay of the Presidency of the Seventy shared a message of hope, encouraging members to never turn away from Christ. Elder Gay encouraged members to see ourselves and others how Christ sees us. Elder Matthew L. Carpenter: Wilt Thou Be Made Whole? 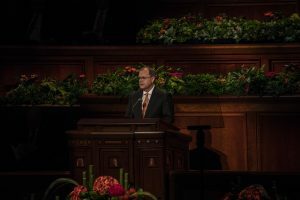 Elder Matthew L. Carpenter, General Authority Seventy, shared the story of how his son had a stroke on his mission and how his companion and the doctors acted quickly, allowing him to heal completely from the stroke. “Jesus Christ can change our hearts, heal us from the effects of injustice or abuse we may experience, and strengthen our capacity to bear loss and heartache, bringing us peace to help us endure the trials of our lives, healing us emotionally,” Carpenter said. Elder Dale G. Renlund of the Quorum of the Twelve Apostles, said that our Father has given us our agency in order for us to learn. “Our Heavenly Father’s goal in parenting is not to have His children do what is right; it is to have His children choose to do what is right,” he said. Renlund said as soon as those that fall away decide to change, God helps them return. 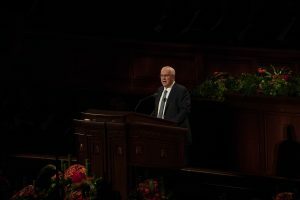 Later on in his talk, Renlund said how deciding to change, and then changing, is repentance. “The magnitude of our eternal happiness depends on choosing the living God and joining Him in His work,” he said. 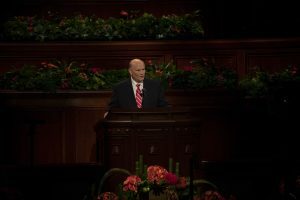 Gerard encouraged members to follow the counsel of Dallin H. Oaks in a 2007 conference address to prioritize choices among all of the worldly demands surrounding us. “May I suggest that the best things in this life are centered on Jesus Christ and understanding the eternal truths of who He is and who we are in our relationship with Him,” Gerard said. He reminded all that they are spiritual beings involved in a human experience. He said for members to take a step back and view all of the changes that needed to be made in their lives and to work towards those changes. Elder Gary E. Stevenson, a member of the Quorum of the Twelve Apostles, began his talk by sharing a story of how a young boy in Brazil, fell away from the church. Award member reached out to him and invited him to return. That young boy is Elder Carlos A. Godoy, now a member of the Seventy. Stevenson gave tips on ministering. 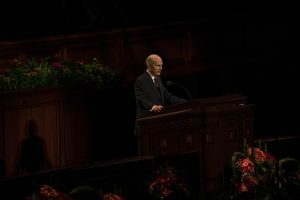 He spoke of a time when President Eyring shared with a group of Saints that ministering is more than “just being nice.” He invited to serve out of love, just as Christ served and to prayerfully seek to serve. Stevenson shared a story of a friend who was a rancher most of his life and, despite all of his efforts to protect his sheep, around 200 were lost. Most of these sheep that were lost fell prey to those sheep that drew away from the protection of the shepherd. While he related that the Lord is our shepherd, he also said all are shepherds in the Church. Once a covenant of baptism is made, that member because a shepherd: to love those around us and to serve them. 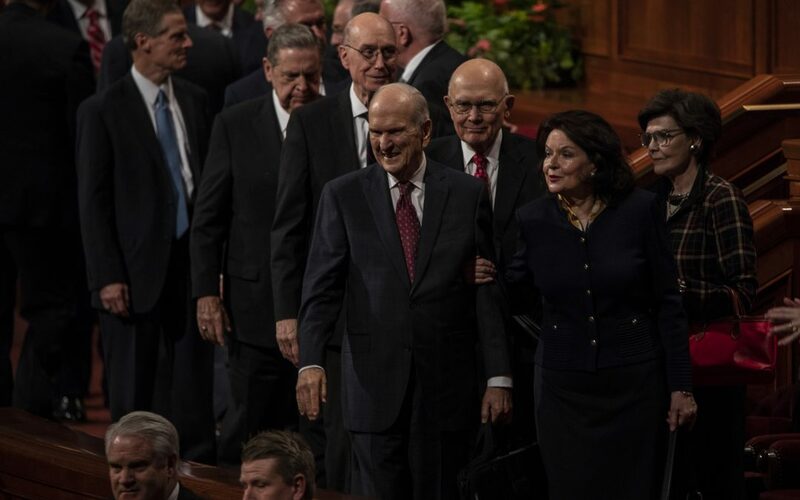 President Russell M. Nelson, President of the Church of Jesus Christ of Latter-day Saints, reviewed over the teachings that had been announced during conference. He reviewed the importance of temples. He also invited all member to worship in the temple and to pray and feel deeply the Savior’s infinite love for you. President Nelson announced “pioneer generation” temples, such as the Salt Lake City Temple, will undergo renovations. He also announced twelve new temples to be built in the coming years.